Minnesota Bowhunters Inc. President Brooks Johnson. Brooks Johnson might just be The Most Interesting Man in Minnesota. He currently serves as president of Minnesota Bowhunters Inc., is co-founder and partner of Northern PondLife, and was part of the two-man team that invented Double Bull Blinds. Brooks has strong opinions on everything from deer management to politics, and his out-of-the-box thinking often finds ways to merge his various passions into moving the needle in ways that benefit wildlife and hunters. What does any of this have to do with a meat stick contest? Trust me, I’ll get there. Each fall there are two Camp Ripley bowhunts in central Minnesota conducted on property that is otherwise off-limits to hunters. Click here to learn more about the 53,000-acre military and civilian training facility operated by the Minnesota National Guard. This year, Brooks decided to kill several birds with one stone during the second weekend of Camp Ripley bowhunting. To promote the Minnesota Bowhunters Inc. (MBI) organization, raise awareness for the upcoming race for governor in Minnesota, and put some pressure on the MN DNR to share the $30,000 - $50,000 brought in during the Camp Ripley bowhunts with the Central Lakes College Natural Resources Department (which does all the legwork for the two special hunts), Brooks decided to conduct a meat stick taste test. You read that correctly. Eager bowhunters take time to offer their opinions on which meat market makes the best meat stick. Here’s how it worked prior to the October 27-28 Camp Ripley hunt: Bowhunters aren’t allowed onto the property until the early morning hours of Oct. 27. You can’t go in early to scout, hang treestands, etc. Instead, you park outside the Camp Ripley gate and camp overnight on October 26. When the gate is finally opened, you show your credentials to the check station staff and then drive onto the massive property. It’s sort of like going to a professional sporting event, except everyone sleeps outside the stadium overnight, seating (in this case, hunting spots) is first come first serve, and everyone enters through the same gate. One line. Get the idea? Because up to 2,000 avid bowhunters take part in the hunt during October 27-28 (up to 2,000 different bowhunters pursued whitetails on the land during the October 18-19 weekend), there are lots of bowhunters with not a lot to do on the afternoon of October 26. It’s classic “hurry up and wait.” Here’s where Brooks had his latest light bulb moment. Brooks understands the logistics of the special Camp Ripley bowhunt, and knowing that he’d have a captive audience, he decided to invite these avid bowhunters to the Main Gate Bar outside of Camp Ripley. He offered free meat sticks to the bowhunters, which is sort of like dangling a chunk of nightcrawler in front of a spawning sunfish; the outcome is 100 percent guaranteed. Meat processors from around the state supplied the meat sticks. Participating hunters were given 10 meat stick samples (random) and then asked to choose their two favorites. The meat market with the most votes won $500, and one randomly selected bowhunter took home a $250 gift certificate to use at any of the participating meat processors. Of course, in addition to the meat stick taste test, the noon to 5 p.m. event allowed Brooks and others from the MBI to talk about their organization, discuss Minnesota’s deer herd, and it gave Brooks the opportunity to explain one-on-one why he believes that candidate Jeff Johnson is the best choice for governor when it comes to legitimate deer management in Minnesota. Like I said before: lots of birds, one stone. Brooks Johnson designed custom arrow wraps to show who he is backing in the upcoming Minnesota governor's race. 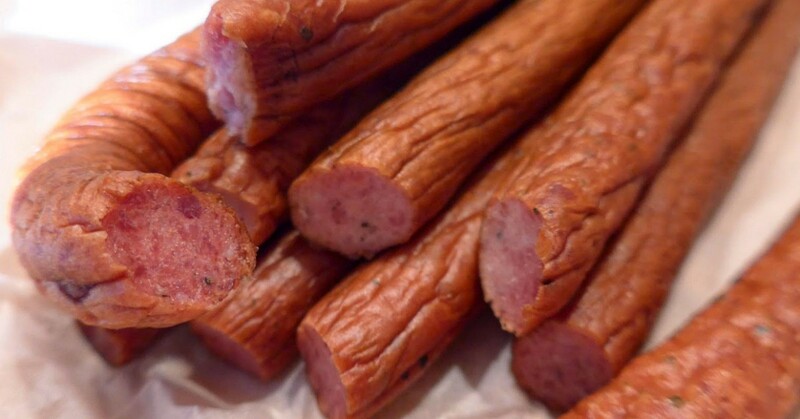 So which meat market sells Minnesota’s best meat stick? According to Camp Ripley bowhunters, that honor goes to Dehmer’s Meats from St. Michael, Minnesota (below). Click here to read Brook’s MBI blog for a recap of the event.